We are a leading name manufacturing and exporting Marble portrait Photo Frames. The proficient and skilled team is specialized in designing durable range of Marble portrait picture Frame which is available at reasonable rates. 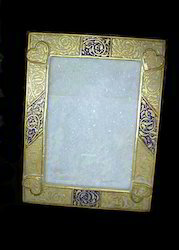 Marble portrait picture Frames is manufactured at our unit using superior quality Marble. The Marble Photo Frames are popular for their style, design and utility. Hence we are one of the highly sought after Marble Photo Frames manufacturers in India. You can cherish the memories with our Marble Picture Frames that offer timeless beauty and elegance to the pictures. We are backed by a sound technical expertise in manufacturing a wide range of Marble Gift Items that are outstanding in design, robustness and creativity. Our adept teams of craftsmen diligently work to create these Marble Picture Frames that are round in shape with intricate designs in vibrant colours across the borders to highlight the picture that is in the centre. This is an ideal gift as well as a decorative item. 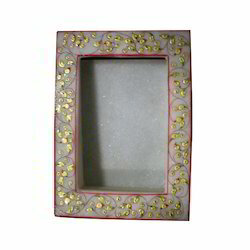 Marble Photo Frames offered are made available by us under item code ME359 and feature use of intricate as well as attractive art work that is done on border areas so as to enhance the overall finish values of these photo frames. 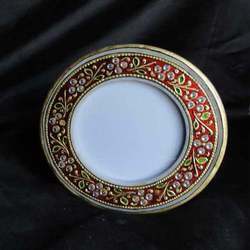 Made available in 23k Gold embossed finish, we can make these available in 6" diameter size options. As these are manufactured in superior quality marble, it helps in providing enhanced style and utility value to these pieces. Marble Frames offered are designed and developed in flawless quality marble finish and are made available by us under item codeMEP339. Featuring quality finish support, these exclusively designed and crafted marble portrait picture frames come with intricate 23k Gold art work done on its border with the overall finish size of the photo frame being 6"x4". As these Photo Frames are crafted using quality finished marble, these are made available in durable finish style as well as design standards. This Gold Embossed Marble Photo Frames illustrates the finesse of marble sculpting and beauty of gold leaf painting from the craft rich state of Rajasthan. A graceful decor piece with utility of a photo frame for your home and office.